Help develop everything from their painting skills to their colour name recall with these Flower Sorting/Paint Trays Assrtd Colours 6Pk. 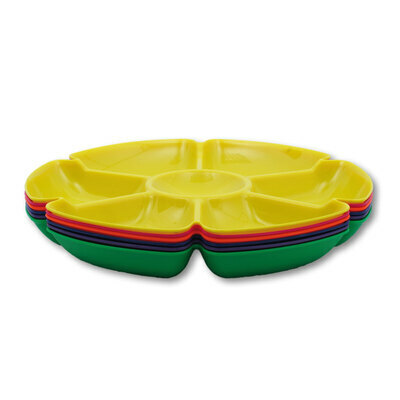 Made from a durable and long lasting plastic which can be easily wiped clean after use, these brightly coloured trays each featured 6 'petal' wells along with a central storage area as well. Their flattened base allows them to sit sturdily on most hard, flat surfaces while each deep indentation has enough capacity to store a wide range of items from paints through to sequins or buttons. Use these sorting or paint trays to encourage your class to mix different colours together or incorporate into your math classes as a tool for counting and sorting. Use these bold paint trays to store and sort items such as our Farm Animal Counters 72 Pk or our Transport Counters 72 Pk. We also have a wide range of educational tools that will assist your curriculum from our Jumbo Playing Cards 172 x 121mm through to our Crocodile Wall Game.